step 1 is probably not shouting down anyone who dares say anything about the 1.6 maybe not being as competitive at some tracks and under some conditions. Can someone tell me what gives 99's an aero advantage? Seems like the NAs would have a lower frontal surface area. NA body was not designed using much or any wind tunnel testing. A wind tunnel was more extensively used in designing the NB and the engineers made efforts to improve the aero performance of the NB vs NA. Article stated that NB had slightly improved drag coefficient and the body created less lift at higher speeds. There was mention of the mirrors and aero improvements from the newer design. Frontal area of the cars is very similar although the shape of the nose is different. How this translates to a lowered car with wider than stock wheel/tire offset I don't know. Let me clarify my OWN personal thoughts since some of my long vetted forum mates might have missed my point...the new guys will understand in time! Despite the perception about the 1.6 anything East of the Sierra's...the last round of parity adjustments did give the little car that could a bump. But that bump only benefitted those who have already campaigned and sorted their cars for years! But it was well known that that bump would be of little help at any high speed, 5th gear, drafting track! If a 1.6 car(or early 1.8)could slip air as well as a NB and pull in 5th gear it would be an overdog. David...what a car is capable of and what it takes to keep it in top form is what I've found myself dealing with. There are always exceptions but as a percentage I see more NA car owners chasing issues that can prove to be very hard to diagnose. My only point was as a car owner I know I wont be building an NA car ever again from scratch. I will take my chances with a 14-18 year old wiring harness and OBD2. That said...Would I buy one(NA car) at a good price if I was on a budget and trying to get my foot in the door...100%! 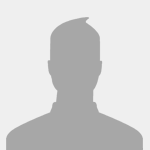 If I wasnt on a budget and I had a 16 year old who wanted to give SM a go...would I encourage them to buy an inexpensive car or rent for a little bit to see what happens? Absolutely! The NA car is a weapon in the right hands with some competent level of prep! At this point parity is splitting hairs(Can we take 20lbs back off the NA 1.8? ). But time Marches on and i'm just not in favor of some effort to essentially overdog the early cars...because that is the only next step in Parity. I'm in favor of a separate class if anything were to ever happen...just my 2 cents! So does anyone know the top speed difference between an NA and a 99 with no drafting influence? From what is being said here they must be different by several MPH. In theory with the same rev limiter...no difference! Same ratios. The question is the time it takes to accelerate from 105 to max speed?? would not be surprised if the lift, and the drag was generated by the NA not having its wheels as shrouded by front bumper as the NB. this of course made worse by the offset and width tires we run. It would be cool to have some acceleration graphs for each car to max speed. Trouble is, it's super dependent on the power curve you choose to use for each car. A couple hp this way or that drastically changes the answer. We would really need to have some well prepped cars dynoed back to back on the same day. But then the question arises, were those cars truly top prep examples or not? Another question is, do you perform the calculations using the same coefficient of drag for both, and if not, how different should it be? This plot assumes calculations using the same C_d*A value for both cars. I'm not so sure about that graph. My NA car was aero limited long before 120 mph on the 3/4 mile straight at BIR. I think I would need a tail wind to get over 115. I think this test would need to be done outside of a simulation. Not getting into any sort of parity talk. OrangeCrush86, if your 1.6 will not top 115mph in a 3/4 mile straight line do something with whatever is keeping it from getting there. For acceleration trace, I'd believe anyone with data tracking would be happy to share data. Get data from a top prep 1.6 and 99 from same time frame at Road America. Steve S., you have some data to share with the young man? I did exclude rolling resistance estimates from this quick calculation, so that has a slight effect. Mostly, the plot is useful for qualitative analysis, due to some of the mentioned complexities. Still, if you can't hit 115mph...how much hp do you have? A good 1.6 will make approximately the same peak hp number as a good 99. You think an NA 1.6 can really get much over 115? I would think 118 would be about the max in 5th. My car is down on hp about 5-8% compared to a new pro motor. The question asked another way, do you think 99 plus cars can reach 120mph at Road America? 2012 June Sprints @ Road America, thanks Todd for posting. Oh, the camera car is a 1.6 driven by Todd Buras. The other cars he's racing are 99 plus cars and the red car is driven grand pa Sandlin. There are two videos therefor watch the entire race and respond with your thoughts. The bones were thrown to the 1.6 after this race. Sure we have data for a strong 1.6 at Road America, but the trick is to isolate laps without a draft and under known conditions. Naturally one tries to get a draft whenever possible and you typically try to work with someone at tracks like that so there aren’t a great many unassisted laps. Aero drag is certainly the greatest potential factor at those speeds but I think where the 1.6 loses out most on long tracks is earlier when extra torque pays dividends early and then continues to pay off in distance traveled over time. As we approach terminal velocity a few HP makes very little difference, the drag is just too great. Any clear advantage in terminal velocity is almost entirely aero. A simulation program can be very useful, but when dealing with cars as close as these already are I am reluctant to give it much weight. Calculating the impact of changes to a given car is one thing. For example, once I have it “tuned” to produce accurate results for a particular car what happens if I add 50lbs of ballast or change the differential ratio. It can be great for that. But even then it’s no simple thing to accurately calculate the impact of a weight change on braking and cornering, which in turn impacts the straights. To accurately calculate the relative full lap potential of two cars as close in performance as these are you need a lot of input parameters and sophisticated math or you won’t do any better than looking at real-world data. In this case, aero is probably the biggest even though it’s not huge in absolute terms. The impact of weight on cornering and braking is not at all as simple as it might sound, and even the differences in suspension geometry can impact handling limits. When we’re talking about a simulator that comes up with only a few tenths of a second on an entire lap, even seemingly minor differences become relevant. Bottom line, if there isn’t an imput parameter for it then obviously it is assumed identical and not reflected in the results. That doesn’t mean they have no value but like any analysis tool they need to be understood for what they can and can’t do. For example, the acceleration graphs above would be enormously more informative if accompanied by a second set showing distance traveled and/or time elapsed. Ideally, assume identical speed exiting a slow corner entering a long straight and display the time each takes to arrive at various points down the straight. That will directly and accurately reflect how/where a time advantage is gained. It is entirely possible for two cars to have very similar speeds at the end of the straight yet one that covers the distance more quickly. Generally speaking, with cars of relatively low power, aero is likely the biggest variable at higher speeds (above about 85, certainly by 5th gear) and power/weight more important at lower speeds. But a small power advantage is still important on long straights because you gather speed that much earlier even though it is nearly irrelevant to top speed. One troll's opinion: a "top prep" 1.6 with a "top" driver will never beat an equally prepped and driven NB at VIR. The torque deficit is too great. The parity ship has sailed, the fat lady sang, the horse is dead, I'm over it. Please can we cut the crap that a 1.6 has a chance? If resale value was no issue, I would build a 1.6. My data points are nothing scientific but enough to convince me: a few guys in my region were consistent podium finishers (dominant) in top prep 1.6 cars and now are average/upper mid-pack guys in top prep NBs. Maybe it's driving style differences, or maybe it's the tracks we run at near me in TX but it had me second guessing my decision to jump in my 99. We have some 1.6s that are as fast as they are ugly if anyone is in the market! But I’d rather sell the ‘99s which are even faster. For reference, we just barely got a chance to drive the ‘99s let alone get up to speed on setup and driving them before life intervened, but we were already equal to or faster than we had been in the 1.6s. So we didn’t gather nearly enough data to make specific parity claims but I wasn’t feeling worried that we might be worse off. For example, at high speed where a car is aero limited, it's actually weight that matters little, and power that primarily determines acceleration. Consider the example of terminal velocity -> net force on the car is zero, thus it's no longer accelerating at all (constant velocity). The drive forces are balanced completely by the aero forces. Add 3 more hp. Guess, what, the car will now continue to accelerate. 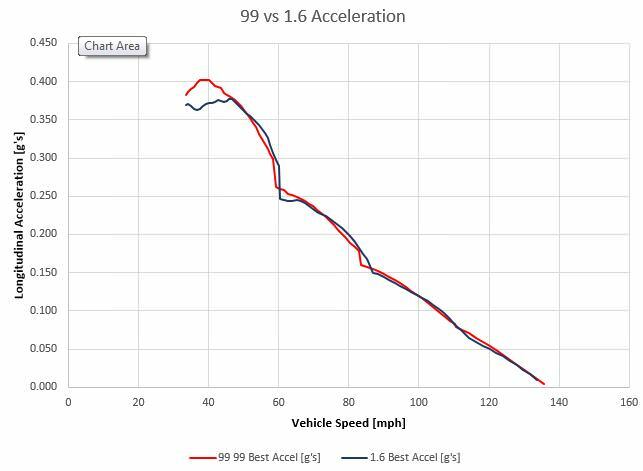 So for the case of 1.6 v 99, where the cars are in their respective hp curves at some particular vehicle speed has a huge impact on acceleration. At high speed right after a shift, the 1.6 lugs a bit compared to 99's, as hp at the bottom of 5th gear is substantially lower than that of the NB cars there. To summarize, at low speeds, power to weight ratio dominates the acceleration rate. At high speeds, power to drag ratio dominates the acceleration rate. The same kind of scenario (shape of power curve) affects exiting a corner. You mention the 1.6 lugs out of some corners due to low power when you are below the power band, compared to NB cars. This can be true, if the particular corner you are exiting has a min/exit speed that puts the cars low in the rpm band. The 1.6 does have a slight acceleration disadvantage at lower rpms. But the flip side is that the 1.6 has an acceleration advantage at higher rpms. If the particular corner has a min/exit speed that puts the cars in the meat of the 1.6 power band, then the 1.6 will actually have an acceleration advantage onto that straight compared to the NB cars. Obviously, this makes the performance difference very track dependent. You're 100% correct that the acceleration graphs I posted above would be more informative when posted with speed and distance and time data. You're correct that distance advantage can be gained early, even if the speed trace at the end of straight doesn't show it. Or vise versa. Fortunately, that's exactly what full lap simulation does, including modeling the corner exit effects, what part of the power band each car is in, etc. And it has the added advantage of always having zero wind, no temperature changes, equal shift times, no draft effects, heat soak, etc. Real data is nice, but often it is so full of noise or uncertainty it's of marginal usefulness for this type of analysis. Ideally, two cars with gps data from same session, (no draft, top driver, etc), and post race dyno for both cars, and then lap simulation could all be compared. That's a tall order, unfortunately. Because then the question is, were those two cars even representative examples of top spec miatas? Who knows... You'd have to do the same test with a large sample size of cars to have any statistical significance. "Explaining things factually is not the goal of the troll here." Apparently calling people names because they have an opinion is a goal. Walt, you are right! I stand corrected. Banish 3 of the 4 variants to the pit of misery (IT) based on participation. Parity issue solved. You guys are splitting hairs and never going to be happy.